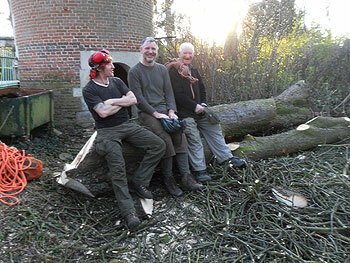 This year the artists coming over to Sacy are three British former artists-in-residence, two of them from the Picardy / Essex exchange scheme, Tony Stallard in 2003 and Ron Suffield in 2007, and Rob Turner who came over for Oise Verte & Bleue with the Great War theme of 2015 - Ron Suffield was there too. 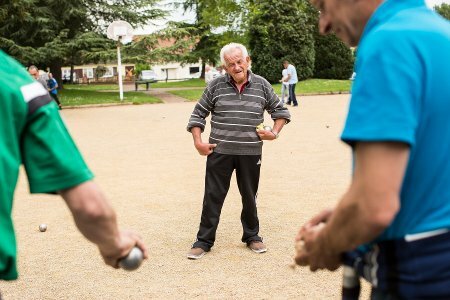 These three returnees will spend a week each in July, with a day when they meet the public and describe what they’ve done since their respective sojourns at Sacy. This will be on July 13th for Tony Stallard, July 20th for Rob Turner, and August 3rd for Ron Suffield. They will return in order to open their month-long September exhibition of new work. (click on the image below). 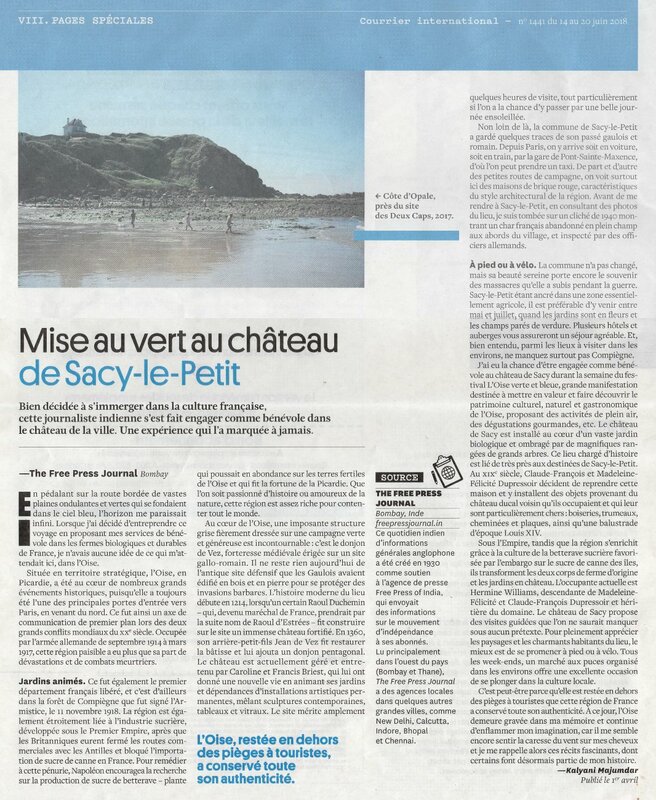 Recently, an article on Château de Sacy and Sacy-le-Petit was written by an Indian journalist WWOOFer who stayed here, Kalyani Majumdar, and published in The Free Press Journal in Mumbai, and then translated and published in the Courrier International (click on the image below). 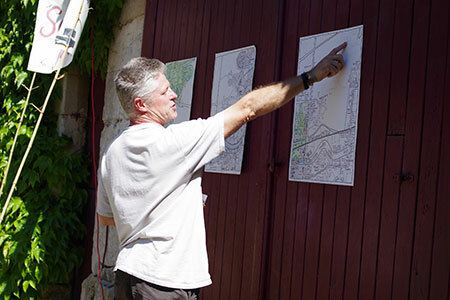 It’s always nice to read of our visitors’ enjoyment of both the château and the region! 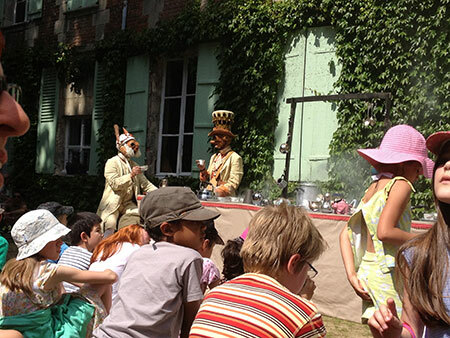 On Sunday 1 July, the Ateliers d’Artistes de Sacy took part in the 3rd Fête des Échanges at the Abbaye Royale du Moncel in Pontpoint. As well as letting visitors know more about our work and handing out catalogues featuring our past artists in residence, we also performed the classic song Relaxez-Vous, originally sung by Line Renaud and Dean Martin in 1955. 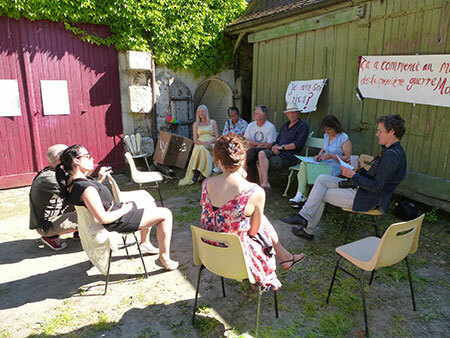 We were delighted to be able to host, on 9 June 2018, the AGM of ROSO (Regroupment des Organismes de Sauvegarde de l’Oise), an organisation which works to protect the quality of life and the environment in our area. A very interesting and rewarding meeting took place and we were glad to be able to help ROSO with its important work. 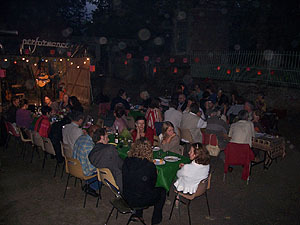 On 29 March, the talented Milo Cummins from Ireland performed a concert at the château which was enjoyed by all. Here is an excerpt from the concert. 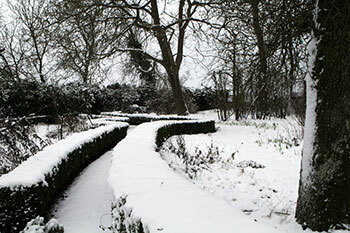 when the grounds and kitchen garden will also be open to the public. 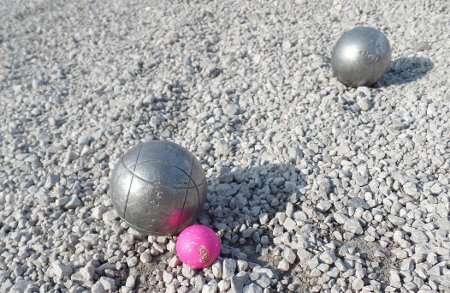 On Sunday May 21st, we are organising a pétanque on its usual permanent spot in the village at 2 pm. Registration at 1.30 pm (5€ per person). 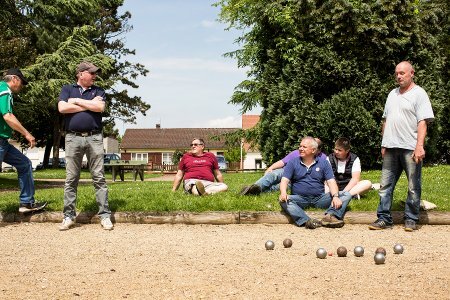 Bruce Rowland, who for many years organised all the pétanque tournaments for Ricard in the UK, will be coming across to Sacy to organise the event. Presentation of trophies at 5 pm. Bar. during each weekend in July. 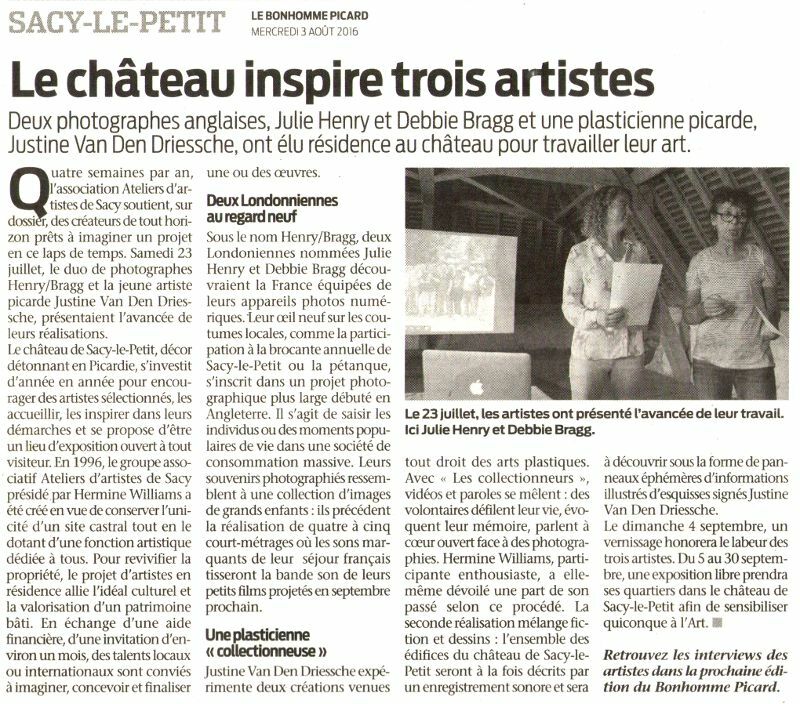 Following our residencies and exhibitions, the following articles by Tommy Lefebvre about the artists Justine Van Den Driessche and Henry / Bragg appeared in Le Bonhomme Picard (click to enlarge). 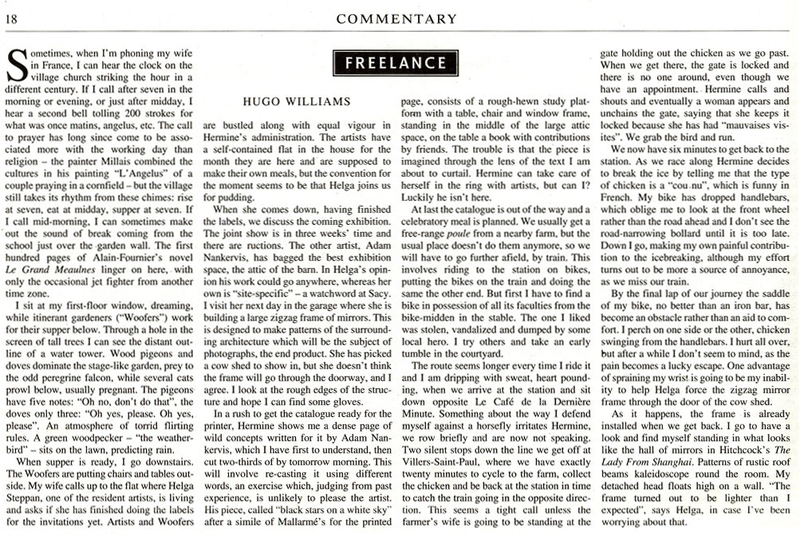 The artists’ pages now include photos and critiques of their work. 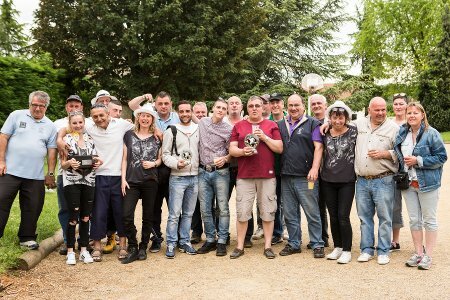 The village pétanque competition held in May was a great success. Refereed by Henry/Bragg and Bruce, 18 teams took part in the competition and fun was had by all. 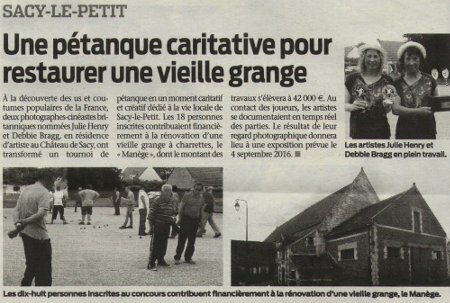 The event resulted in a donation of 200 euros towards the restoration of the village’s old and very rare “manège”, the wooden structure used to protect the harvest while unloading it into the ancient barn. Thanks to all who took part! 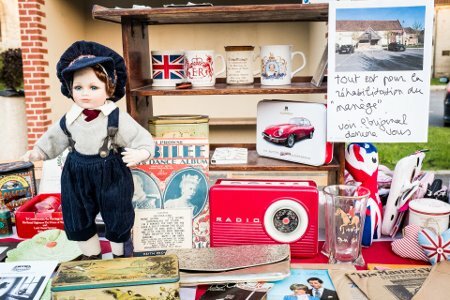 Our British-themed stall at Sacy-le-Petit’s annual brocante a week earlier was also successful in raising an additional 100 euros (making a total sum of 300 euros for both events) towards the restoration of the manège, which will take place next year. 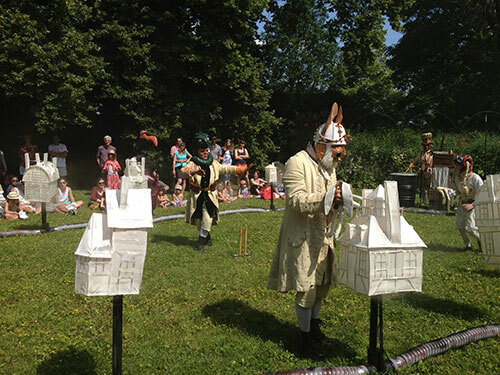 As part of the “Jardins en Scène” festival, Justine Van Den Driessche proposes an itinerary of follies in the garden at Sacy. 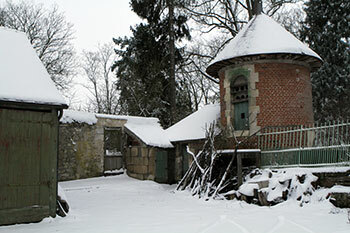 “Les dix promenades du rêveur à la recherche de fabriques disparues” is inspired by the vanished constructions of Ermenonville, which remain in name only and which will be re-born here in September. 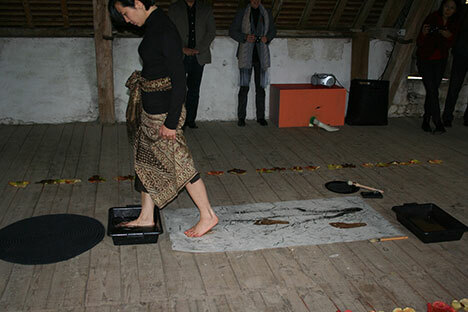 In a participatory project, the artist invites the audience to appropriate history with its own memories. The project will include an interactive dimension via an internet website, extending the promenade into the imagination. 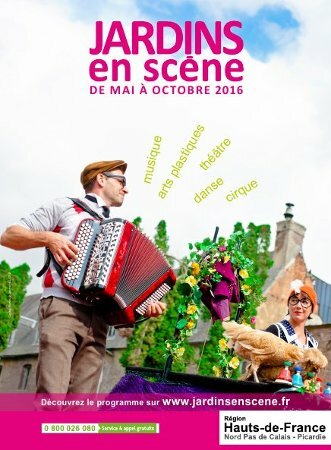 “Jardins en Scène” takes place all over Hauts de France (Picardie, Nord, and Pas de Calais) from May to October. 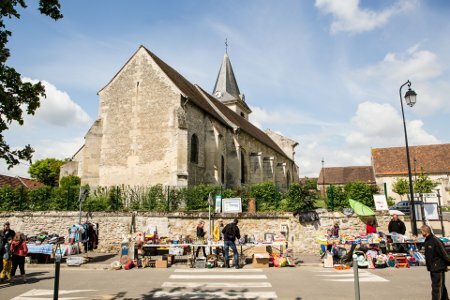 On Sunday May 15th, summer artists in residence Henry/Bragg are running a stall at the village’s annual brocante, from 6 am to 6 pm. 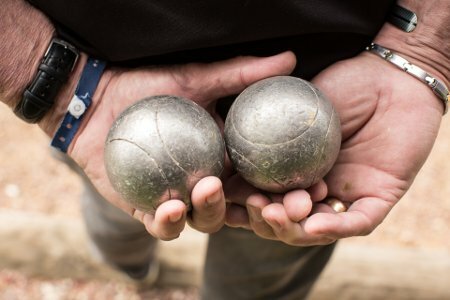 During the village fête, the following Saturday, May 21st, Henry/Bragg will be organising a pétanque on its usual permanent spot in the village at 2 pm. Registration at 1.30 pm. Presentation of trophies at 5 pm. Bar. will take place on Saturday 23 July at 4pm - all welcome. 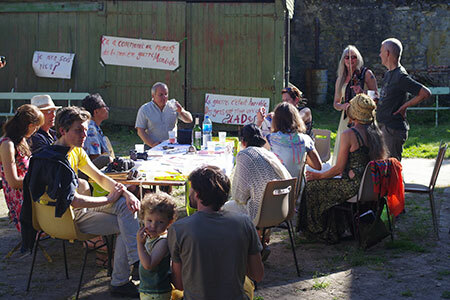 Re-opening of the summer exhibition with a Guided Tour by artist-in-residence Cyril Lepetit, to be followed on the Saturday by a round table with refreshments. 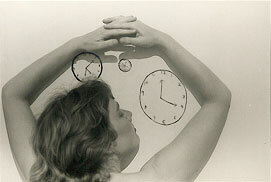 The exhibition will close definitively at 5pm on Sunday. 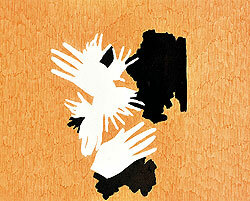 in the style of the artistic movement that existed during the Great War. 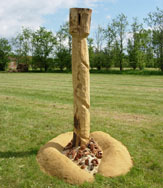 Workshop with Ron Suffield: creation of memorials by the pupils. 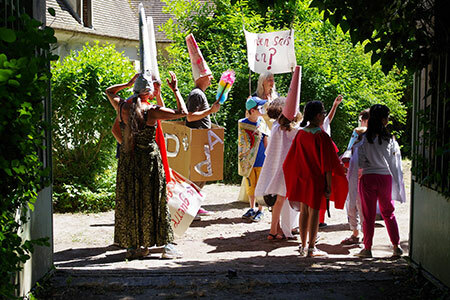 3pm - Procession through the village by the pupils in Dada costumes with “punk” sound effects created by them. 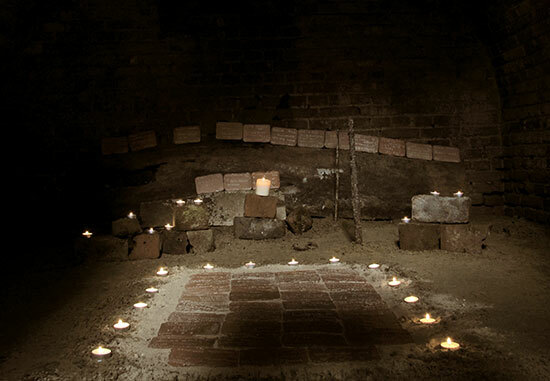 4pm - Ron and the children install their “memorials” in the château’s cellars. 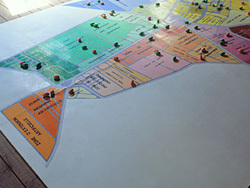 4.30pm - Presentation of the imaginary local map created by Rob Turner. 5pm - Reading of “The Memories of Armand Dupuis”, born in Les Ageux, former mayor of Nointel and Sacy-le-Petit, radical-socialist MP: “The Great War as an artilleryman”. 6pm - “Café des Alliés” - singing aperitif with accordionist Sylvie Méheust: communal singing of wartime classics such as La Madelon, Mademoiselle d’Armentières, Good Bye-e-e, I Wore a Tunic etc. 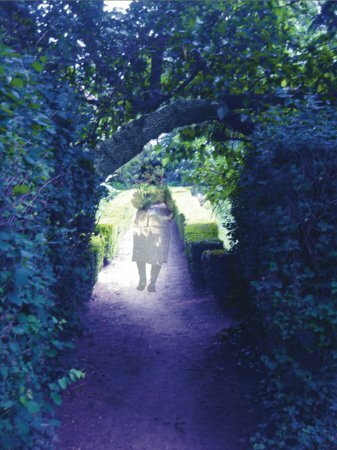 6.30pm - Introduction to Spiritism with Christine and Jennifer Binnie. (17.50€; 8€ for children less than 16 yo). Reserve your tickets as early as you can. 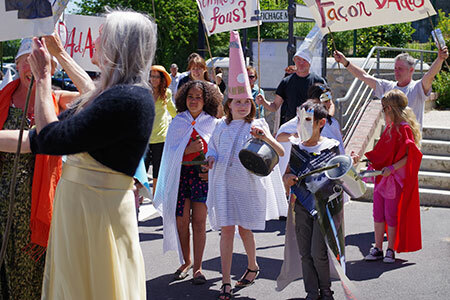 4pm-6pm - Presentation of the finished imaginary local map created by Rob Turner and screening of footage taken during the previous day’s procession. The artist Rob Turner will be cycling around the local area for two days, stopping to take photos and collect information on buildings, landmarks, and names of streets and places. As a result of his observations, he will then create an “imaginary map”, also incorporating elements of stories provided by local people. 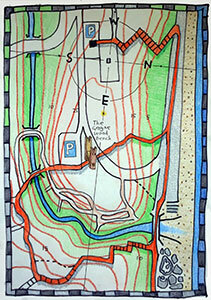 Other illustrations and anecdotes will be added to the map by visitors to the exhibition. 4pm-6pm - Screening of Bryan Forbes’ “Seance on a wet afternoon”, 1964, and other films with elements of Spiritism. Halloween is the time of year when the veils between the worlds are the thinnest. It is the time to remember the dead, clean out the old and look into the future. 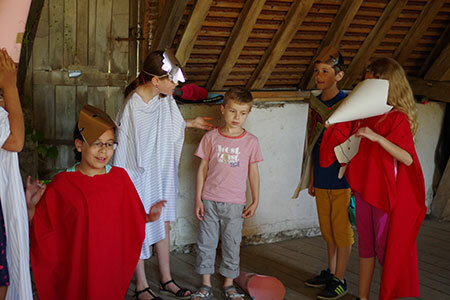 You are invited to come to the Château de Sacy, Hermine’s home, which has housed many generations of her family. You and your ancestors are invited to join Hermine and her ancestors in a ceremony of remembrance, letting go and “seeing”. We will have a ritual fire, separate man and woman time, time for reflection, singing, dancing, “seeing”, a wart removal ceremony, and a ritual feast in the presence of our ancestors. 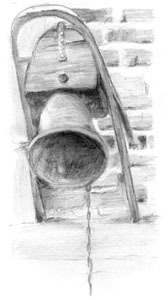 Bring the names of your ancestors and photos /drawings/objects to represent them. Bring a song from your ancestors. Bring the names of friends and family and animals who have died in the last year and photos/drawings/objects to represent them. 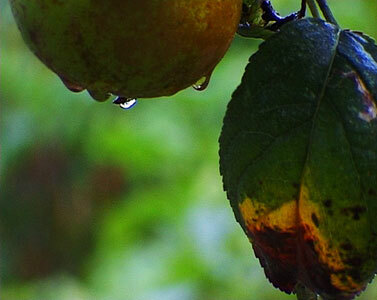 Bring l lb of Coxes Orange Pippins or Russets. Bring a veil and wear white or pale colours. Bring a list of regrets from the last year to burn on the ritual fire. Leave food and drink for the spirits of your house while you are away. Preparation for the ritual will start on Thursday at 5pm, with the creation of a gallery of ancestors. 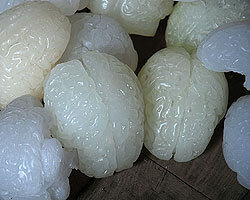 On Friday we will join the French by laying Chrysanthemums on the tombs of our ancestors. I shall arrive on the Thursday 30th of October. I am a vegetarian - Yes / No. 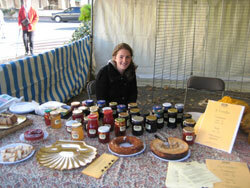 Participation of £90 includes your own bedroom, up to three nights, and two meals a day. 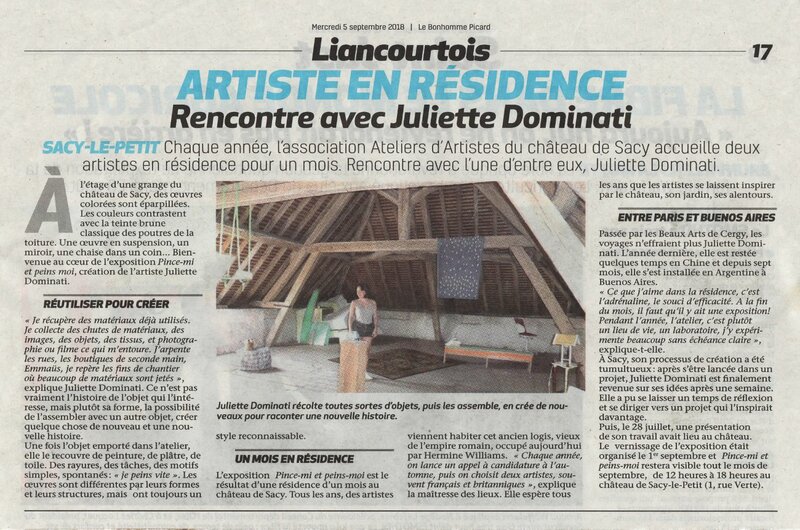 Membership to Ateliers d’Artistes de Sacy. You will go home lighter! Alain Jacomy et Alma Tischler Wood. 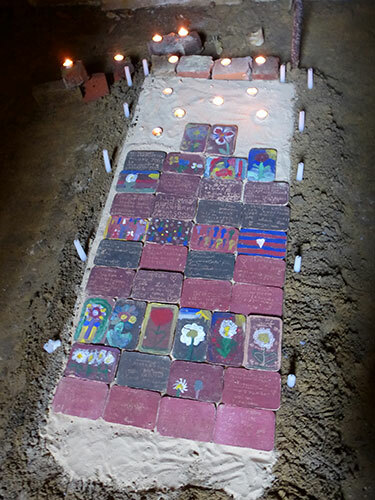 Installation / Memorial by Ron Suffield created for Oise Verte et bleue with the pupils of the local primary school. 4pm - Two English artists foresee their death: multimedia performance by Anne Bean, reflecting on the works of Stephen Cripps and Paul Burwell at the Café des Alliés 32 years ago, curated by Hermine Demoriane and stimulated by reflections upon WW1. 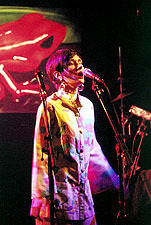 Cripps and Burwell’s performances were both concerned with premonitions of death and plane crashes; these two artists, with whom Anne Bean frequently collaborated, have since died. The performance will attempt to revive the sense of dynamism, of risk and poetry that was enmeshed in these artists’ work. 5pm - Singing aperitif : Christelle Hirsoil accompanies us on the accordion as we sing La Madelon, Mademoiselle d’Armentières, It’s a Long Way to Tipperary etc. Click below for details. Free entry. Welcome to the world of Lewis Carroll! 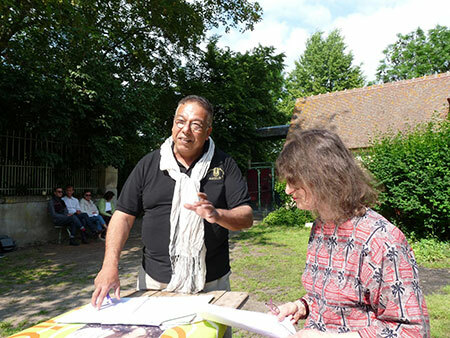 An artistic-gourmet day in memory of the Great War, focussing on Armand Dupuis and Camille, his mother. 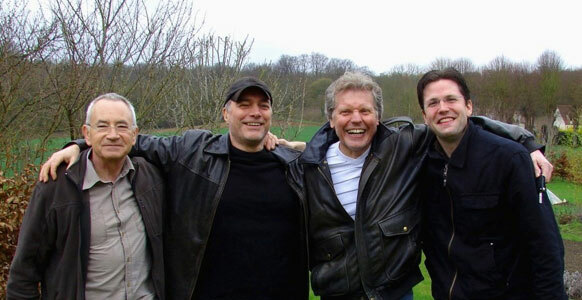 with Ron Suffield, visual artist (United Kingdom). 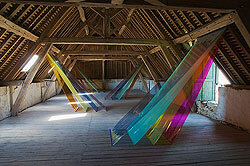 Installation by Sico Carlier, visual artist (Netherlands). 4pm: Reading from the memories of Armand Dupuis, born at Les Ageux, mayor of Nointel & Sacy-le-Petit, Radical-Socialist MP: La Grande Guerre comme soldat artilleur (The Great War as an artilleryman). 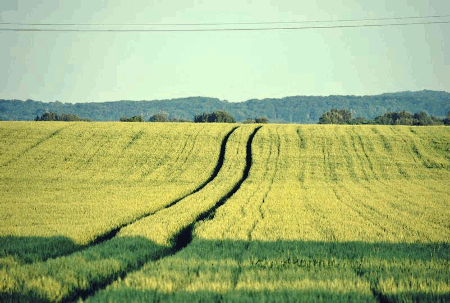 “Sentier des Poilus” et “Sentier du Buvier”. 6pm (Sunday): End of programme. 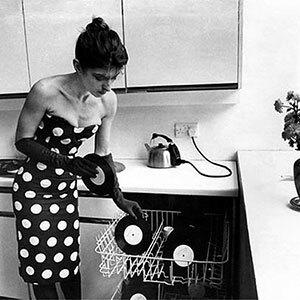 6pm (Saturday only): Singing aperitif (La Madelon, Mademoiselle d’Armentières etc. 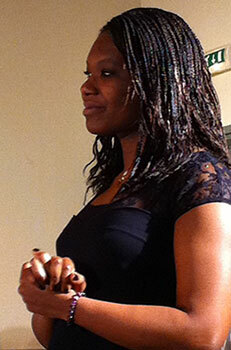 ), accompanied on violin by Claire Guilissen and accordion by Christelle Hirsoil. 17.50€ (7.50€ children under 16 years of age). 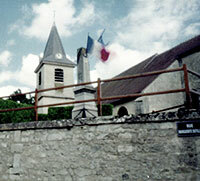 made in the château, the village of Sacy-le-Petit and Writtle College. Click below for details. All welcome! 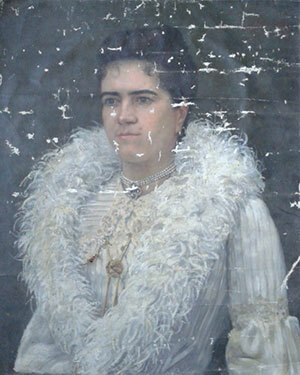 centre left: Marion Crezée with her ephemera. centre right: haikus written by pupils from the local primary school. 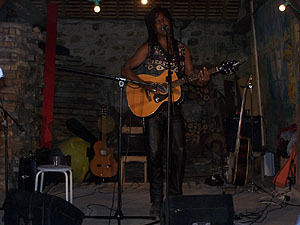 bottom: The Fall Collective: Isabel Asúnsolo, Marion Crezée, Erlina Doho and Hermine Williams. This year we will be welcoming Isabel Asúnsolo, haiku writer and publisher, and artists Erlina Doho and Marion Crezée to the château as part of the annual event. Wednesday 16 - Sunday 20 October; 2pm - 6pm Marion Crezée will display her work, as well as those created by children from the local school after the walk she will be doing with them on Thursday 17th. Friday 18 October; 2pm - 5pm Isabel Asúnsolo will be carrying out a haiku workshop for children at the local school (private event). 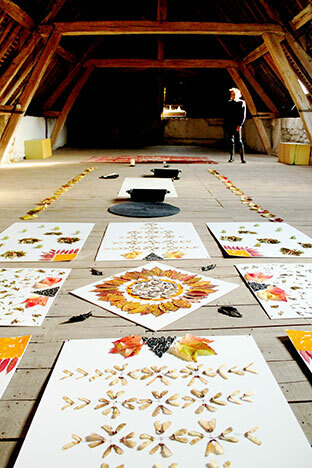 Saturday 19 October; 3pm - 4.30pm Erlina Doho will be giving a calligraphy-based performance, while asking children to create drawings inspired by nature in order to illustrate (or not) the written haikus. 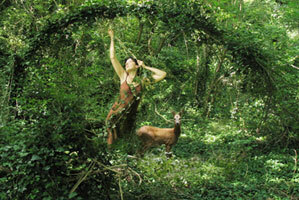 Isabel Asúnsolo will be carrying out a haiku workshop for parents / adults. The grounds and the exhibitions are open to the public following the residencies of Vicki Thornton and Maria Fernanda Sanchez-Paredes. 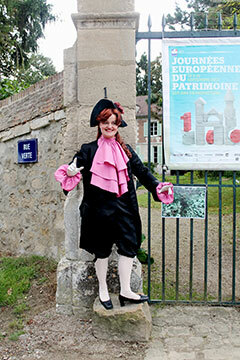 Special tour led by Pivoine d’Orange, a baroque guide from the Compagnie du Théâtre du Pressoir. She looks back, in a humorous fashion, at the history of the château. By reservation only (tel: 03 44 29 09 14). Gratuity requested. Click on the image below to read an article (in French) that recently appeared in the Courrier Picard on the subject of WWOOFers here at the Château de Sacy. 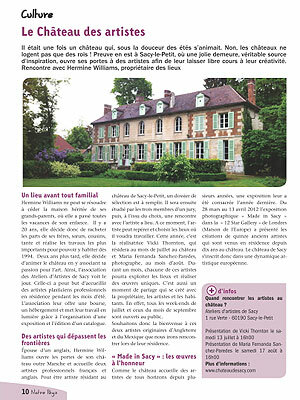 An article on the Château and our work here has been published in the July-August edition of “Notre Pays”, the magazine of the Communauté de Communes des Pays d’Oise et d’Halatte. 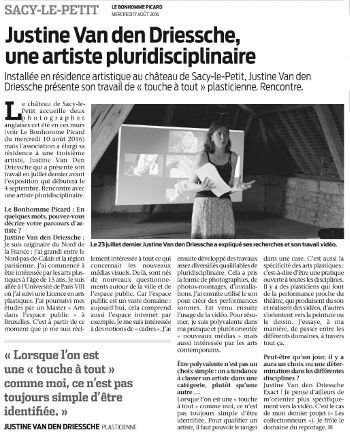 Click on the image below to view/download a PDF version of the article (in French). 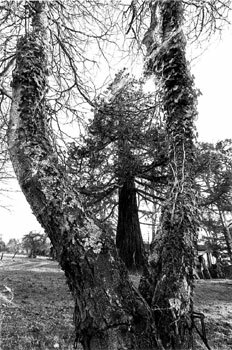 The band Horseless Headmen recently made available some blackbird song recorded here at Sacy on their album The Whole Nine Yards (track: “Scratched Beyond Help”), released on North Circular Records. Click on the players below to hear the birdsong as it appears on the album track and on the original recording (the audio may take a few seconds to load). 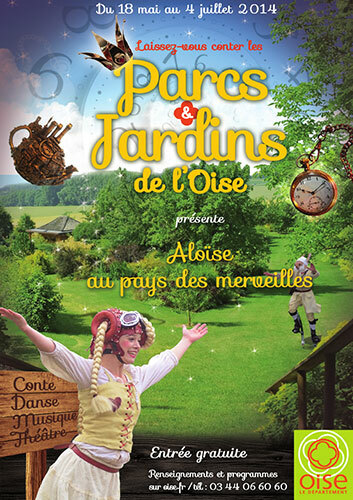 School preview with Pivoine d’Orange from the Théâtre du Pressoir: Jean de la Fontaine’s fables with baroque diction and gestures. 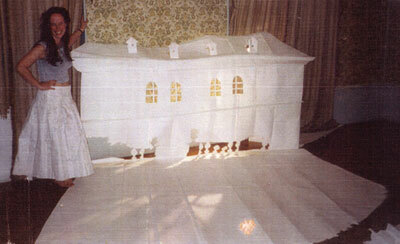 The show uses costumes and mock candlelight. 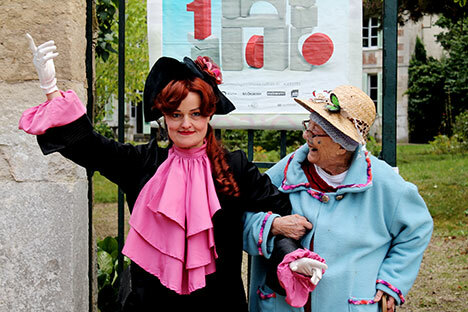 2pm - Burlesque promenade with Pivoine d’Orange. 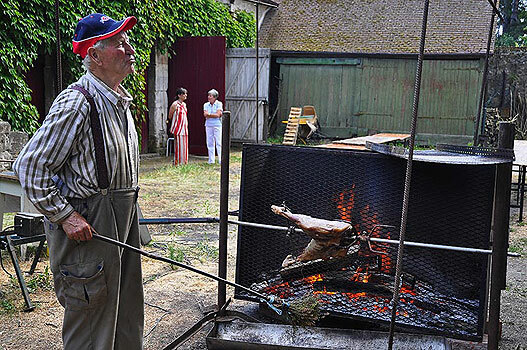 Departs from Château de Sacy, visiting Saint Quentin’s Church, Saint Catherine’s Chapel, and the Petite Brasserie Picarde in Grandfresnoy (arriving at 4pm for a local artisanal beer tasting). 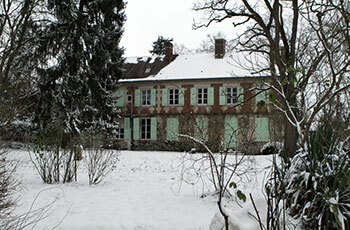 Visit of the Château de Sacy upon return. 8pm - George’s famous Méchoui - 17.50 € (8 € for children under 16). 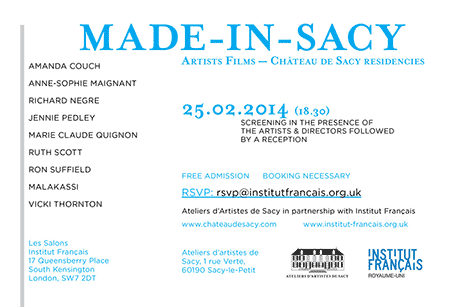 Book your place through Château de Sacy, 1 rue Verte, 60190 Sacy-le Petit (03 44 29 09 14; info@chateaudesacy.com). 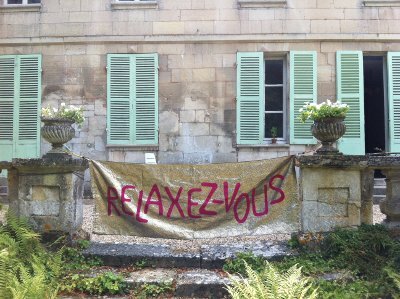 We at Ateliers de Sacy were greatly saddened to hear of the untimely passing of Laurence Nyx who was to be the artist in residence at the château in August. So that her memory may live on in these pages, her artist page shows some of the beautiful work that she created. The photographer María Fernanda Sánchez-Paredes will now be coming to Sacy as artist in residence this August, following Vicki Thornton’s residency in July, and we look forward very much to welcoming them both here. 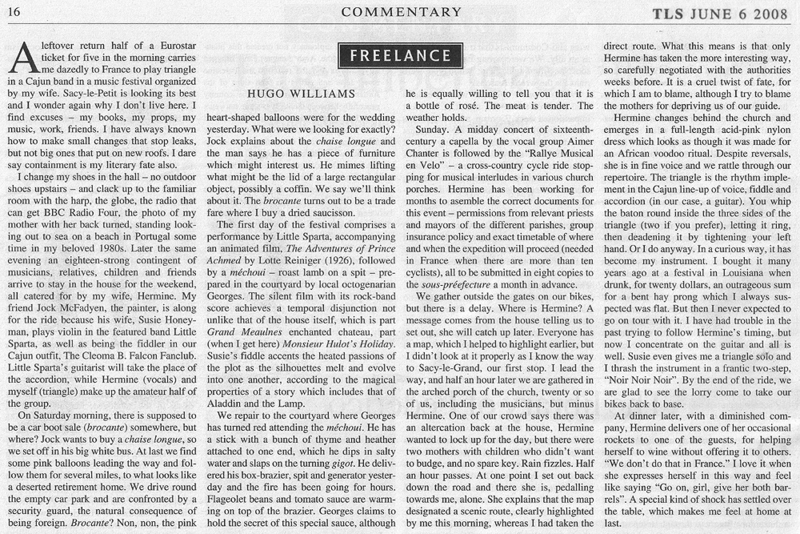 Hermine Williams was recently interviewed by Fixe Magazine, looking back at some of her colourful association with music and the performing arts over the years, and selecting some of her favourite music. 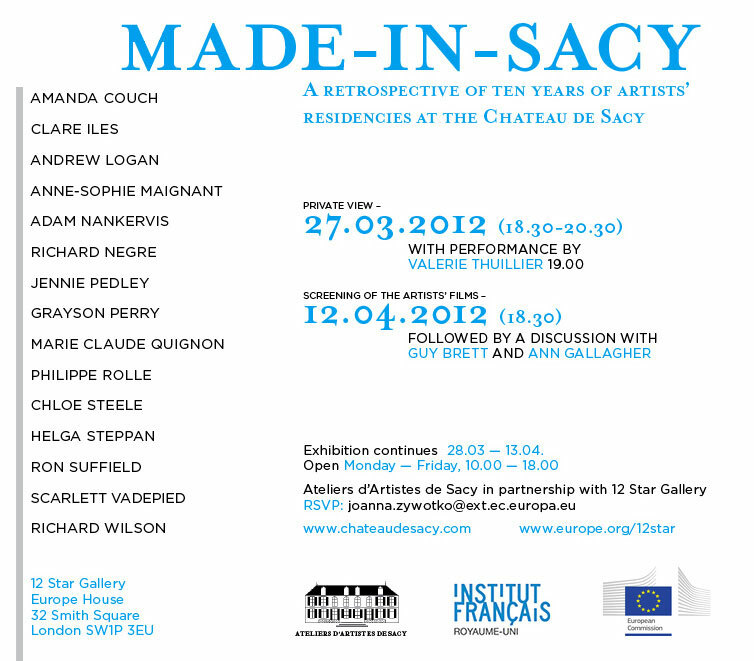 The 12 Star Gallery has now posted photos on its Facebook page of last year’s successful Made-in-Sacy exhibition in London. 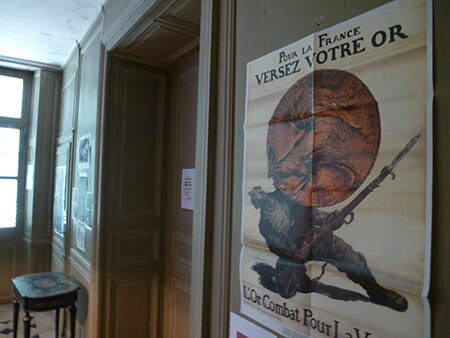 As part of the gallery’s remit to show work which celebrates the creativity and cultural diversity of the European Union, works of art created by 15 of the British and French artists who have been in residency at the Château were on display. who came for a recce in January. She will be back in July. 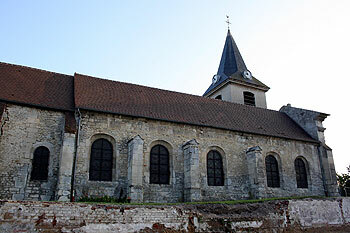 Following the theme of “Hidden heritage”, there will be a guided visit inside and outside the local Saint-Quentin church, one side of which has now been unveiled by the demolition of a large farm shed. 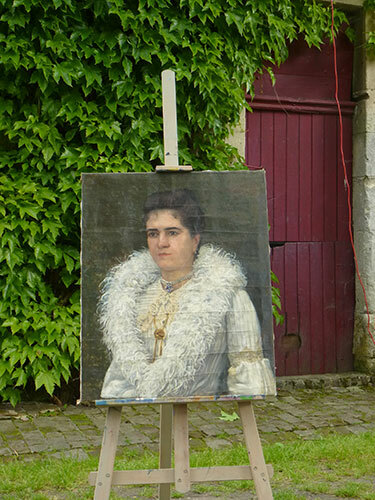 The grounds of the Château de Sacy will be open to the public and the annual exhibition of the resident artists’ work will be on display. 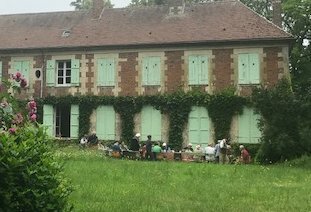 On 20 August, the local TV channel FR3 Picardie showed a news item about the WWOOFers at the Château, featuring American WWOOFer Hilary Stein teaching how to keep slugs away from the sorrel plants in the kitchen garden. (Private View: Sunday 2 September at 4pm). With the help of Conseil Régional de Picardie, Conseil Général de l’Oise and the village of Sacy-le-Petit. Entry to all events is free except the méchoui. 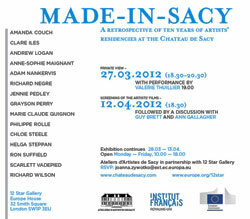 2 - 5pm MADE-IN-SACY - screening of artists’ films from the retrospective held earlier this year in London. 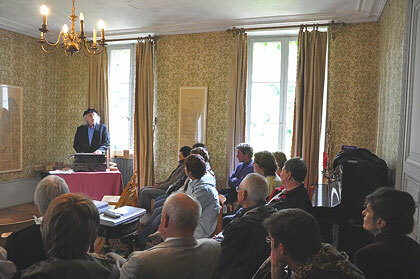 5pm Thomas Bloch’s concert Eau, cristal et miroirs with his glassharmonica and his ondes Martenot (please book through info@chateaudesacy.com as there are limited seats for the concert which takes place in the château’s sitting-room). More info on Thomas Bloch: http://www.thomasbloch.net/. 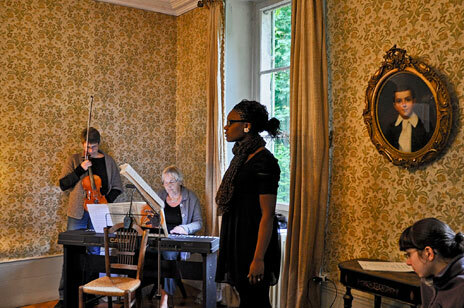 7pm George’s méchoui - £12.50 (£6.50 for children) - please send booking by cheque to Ateliers d’Artistes de Sacy, 3 Raleigh Street, London N1 8NW. 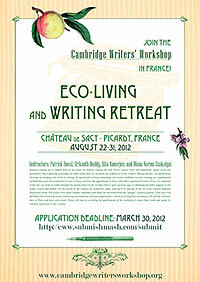 Writers of all genres are welcomed to apply (deadline 30 April) for the Cambridge Writers’ Workshop writing retreat at the Château de Sacy from 22-31 August 2012. 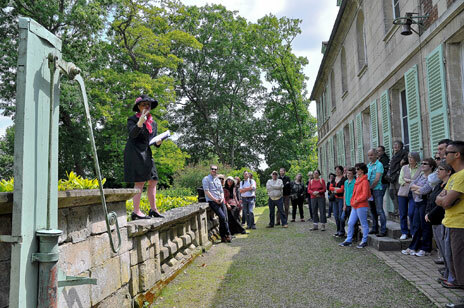 All writers selected for the program will be housed at the Château where writing workshops, craft seminars, and in-session writing exercises will take place. available from the CWW web site. followed by a discussion with Guy Brett and Ann Gallagher. 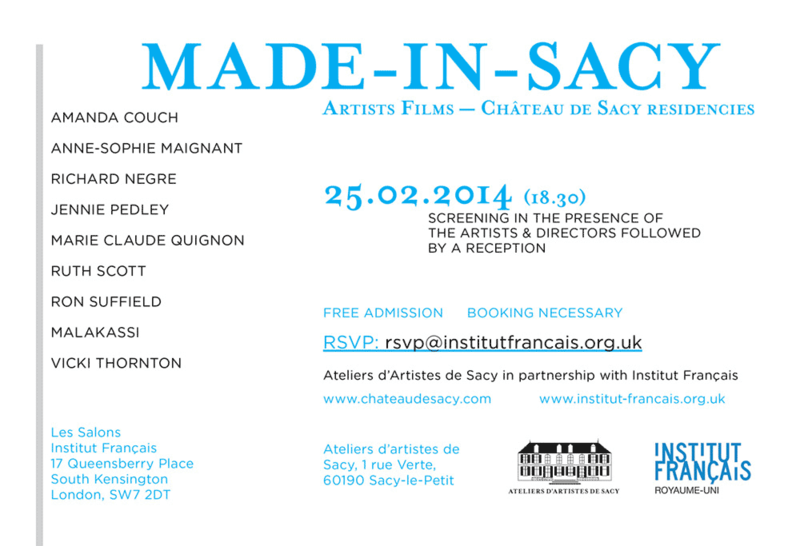 Made-In-Sacy features some 15 artists from France and the UK who have completed residencies at the Château de Sacy - artists such as Richard Wilson, Grayson Perry and Andrew Logan. 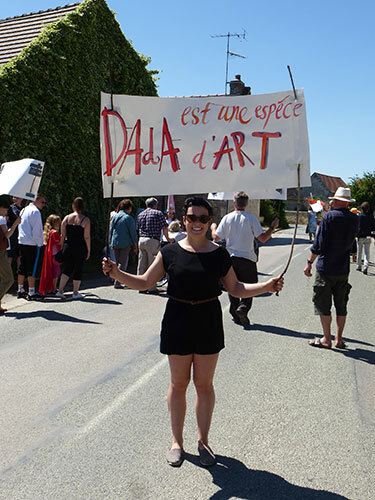 The exhibition encompasses the spirit behind each artist’s work and their response to the setting of the Château, whether in the form of photographic documents for site-specific installations, or by way of animation, painting and performance. The show will include a talk by art critic Guy Brett and Ann Gallagher, Head of Collections at Tate Britain, as well as live performances. 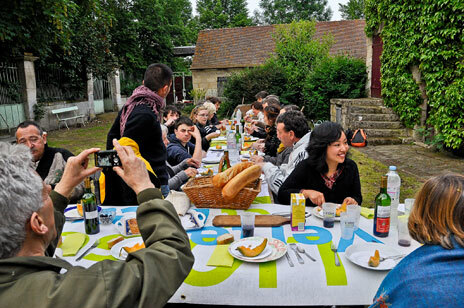 Three former artists-in-residence at the Château will be returning to combine their talents as part of “Générations/transmission”, our contribution to the annual Invitations d’artistes event. On Saturday 1 October at 6pm, Valérie Thuillier will be performing “Genèse #1 intramuros” along with Hervé Hemme. Described as a “burlesque and contradictory show” the performance, which will also be filmed, is based on the transmission of subjects, their history and life through childhood, adolescence and adulthood. During the week, Ron Suffield will be working with the pupils from the local primary school. Each child in the school will be given a small box to take home, and will be asked to get their families to contribute an item to the box from their childhood such as a photograph, small toy, or even a written testament. The children will then decorate a “legacy” trunk and add to it sheets of paper including an item from the village such as a flower, seeds, leaves or small piece of cloth. During the weekend, all the families will take part in an event where they will paint a scene from their childhood, to be added to the trunk along with photos of all the participants. The legacy trunk will be kept for future generations to enjoy. Richard Negre will also be involved during the week with the pupils from the local school, making an animation film “Loops” with them. 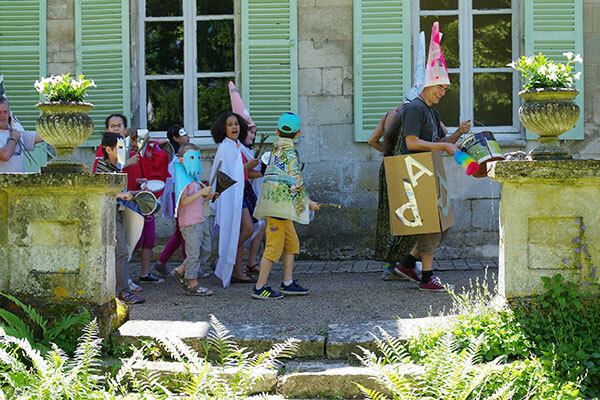 On Saturday 8 October at 11am, parents and the general public will be invited to the château to the screening of the film of Valérie Thuillier’s performance, the animation movie made by the children under Richard Negre’s supervision, and the filling up of the trunk brought by Ron Suffield. 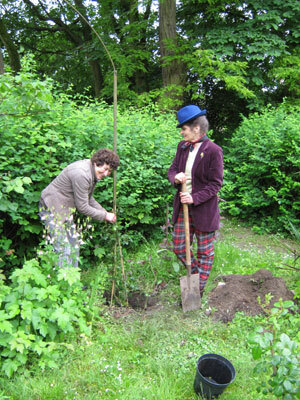 The Canadian Artist Jacques Desruisseaux was in residence at Sacy from 23 - 29 July to create his project “Au cœur de l’arbre”. Financial support for the project was provided by the City of Sherbrook, Canada. (Opening Day: Saturday 3 September at 4pm). 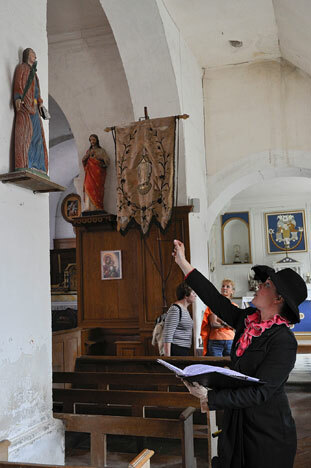 With the help of Direction Régionale des Affaires Culturelles de Picardie, Conseil Régional de Picardie, Conseil Général de l’Oise and the village of Sacy-le-Petit. 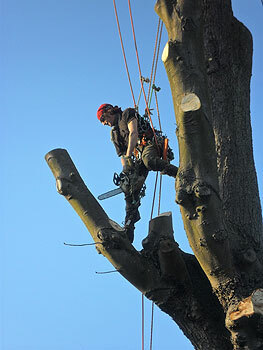 The horse chestnut in the courtyard, one of the trees in the Château’s grounds that is currently being tended by our tree surgeon Jason. 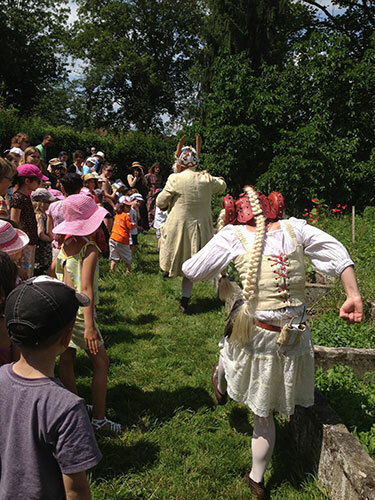 Entry to all events is free except the méchoui (15€ per person, 10€ children under 16 y.o. - please let us know as soon as possible if you are taking part). 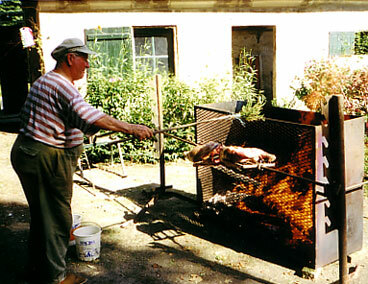 Dhouailly with René Bourdet in La Spouze, Creuse. 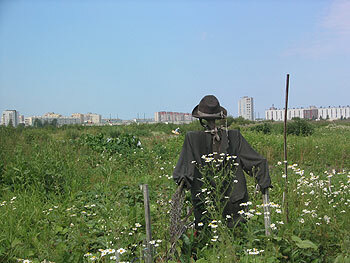 of allotments in Detroit, USA, and St Petersburg, Russia. Sub-titled. “Le jardin magique” by Philippe Rolle. 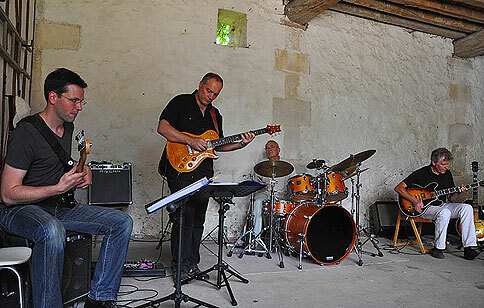 17h Specimen Quartet - jazz (Myspace page). The A.G.M. will take place at 6pm. Saturday 3 September - Sunday 2 October. Preparation for the ritual will start on Saturday at 5 pm, with the creation of a gallery of ancestors. On Sunday we will join the French by laying Chrysanthemums on the tombs of our ancestors. I shall arrive on the Saturday 30th of October. I am a vegetarian /Yes / No. 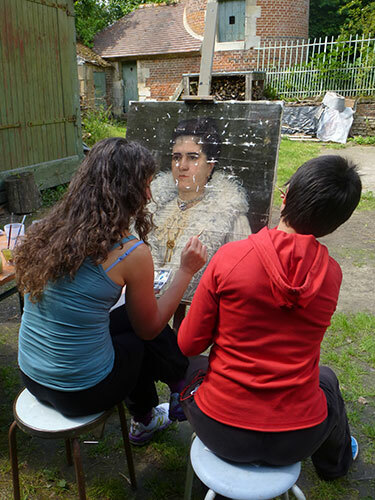 Participation of £95 includes your own bedroom, up to three nights, and two meals a day. 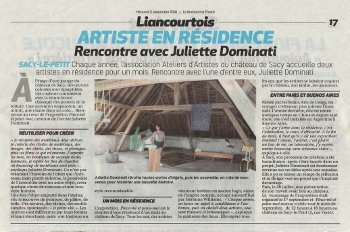 Membership to Ateliers d’Artistes de Sacy. End of the exhibition following the residencies of Adam Nankervis and Helga Steppan (Helga will be present). 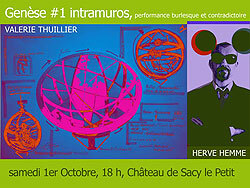 Come to Sacy for this “vernissage in reverse”. Refreshments from 3pm. Or come and have lunch from noon, bringing something with you. R.s.v.p. 03 44 29 09 14. 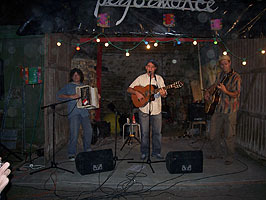 ChagallPAC presents a lively set of contemporary and classical music mixed with poetry. 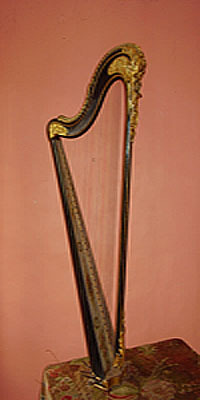 Musical features include the Six Metamorphoses after Ovid by Benjamin Britten and Sequenza VII by Luciano Berio. These pieces are blended seamlessly with poetry recited by Diana Norma, and additional poems and music inspired by other works of art, poetry and literature. 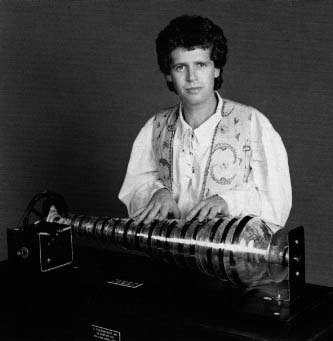 This concert features the sonic sensation of Soundpainting, the live composition of music with gestures, invented by Walter Thompson. 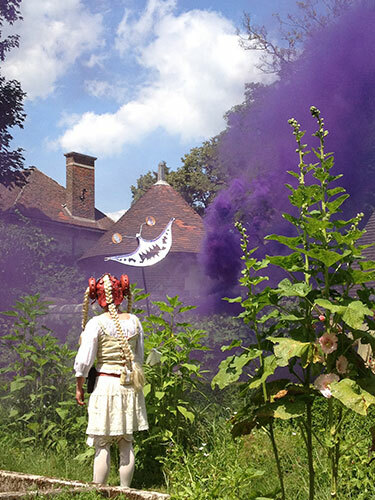 Come learn how to Soundpaint, and become an active part of this artistic soundspace painted by the Chagall Performance Art Collaborative. 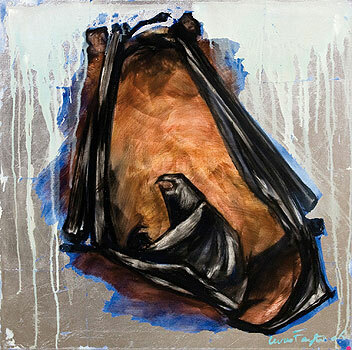 10am - 6pm “Watercolours of the Château and the village painted during the previous week” and “Bats (mixed media on frames)” - exhibitions by Sophie Lucas-Faytre (the artist will be in attendance). 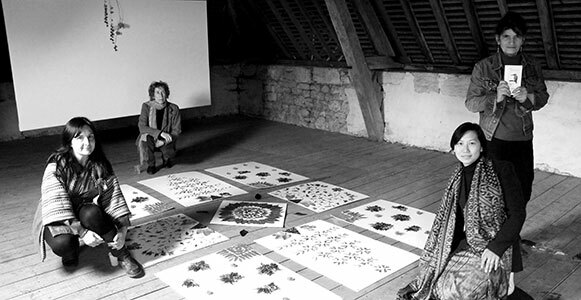 “Plexiglass engravings of poems and drawings of flowers made by children from the local primary school” - exhibition by Ronald Suffield (UK) (who will demonstrate his work). 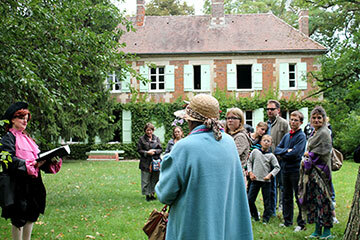 Forest garden visit in the company of students from the Ribécourt Horticultural School, outside the Château grounds at the entrance to the village. 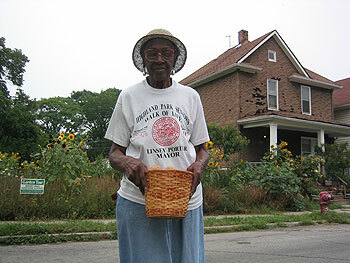 4pm Garden Stories” - film made by Boris Gerrets (Netherlands) on the subject of allotments in Detroit, USA, and St Petersburg, Russia (the director will be in attendance; sub-titled). 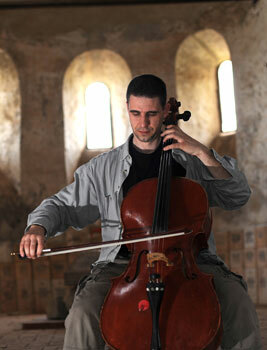 8pm St Quentin Church: “Cello Suites (J.S. Bach)” by Andrei Kivu (Romania). 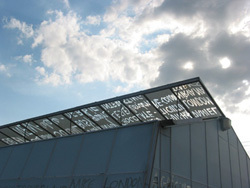 10am - 4pm Exhibitions (see Saturday) open to visitors. 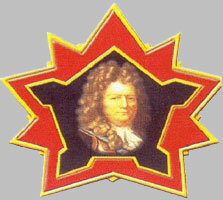 The A.G.M. will take place at 11.30am, followed by lunch. 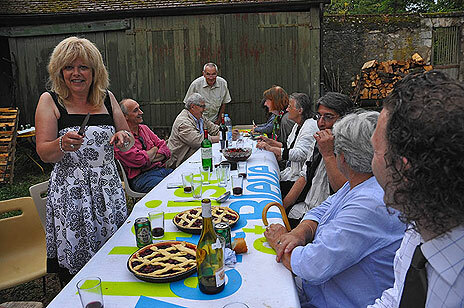 To celebrate ten years of summer residencies and September exhibitions in Sacy, all of the artists who have graced us with their work have been invited for this year’s event. 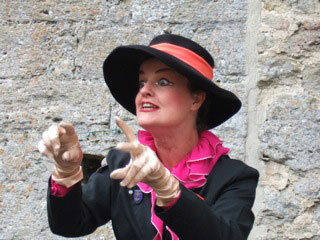 At 2.30pm there will be a performance by Amanda Couch, our first artist in residence. This will be followed by a medley of artists’ films shown over the years at Sacy. For more information, and to book a place at the event, please contact us. 26 September to 4 October. 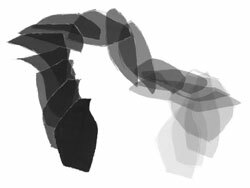 Working in conjunction with the inhabitants of Sacy-le-Petit, Ruth’s project explored how the body can be mapped out, by tracing its movements and plotting its absence. For more information, click here. 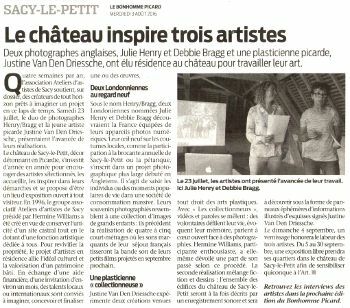 showing the work of Richard Negre (“Déplacement nocturne”) and Ruth Scott(“Trace”) (whose work was retained for this year’s Invitations d’artistes). 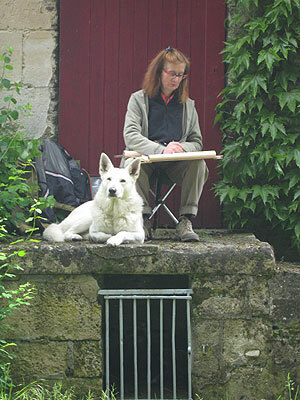 Ruth Scott will be here from 16 July until 13 August. She will be presenting her work on 8 August at 4pm. 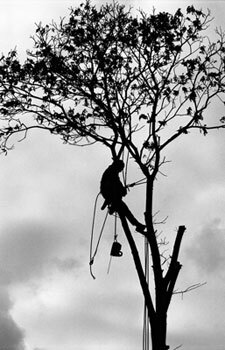 2 pm “Trees of the Spouze” - photo exhibition by Philippe Rolle. 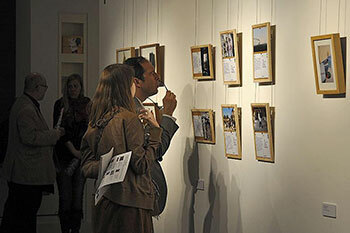 “Silhouettes of Elagage” - photo exhibition by Katy Peters (UK). 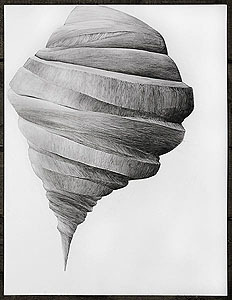 “Trees according to nature” - exhibition of drawings made by Gudrun von Maltzan the week before. 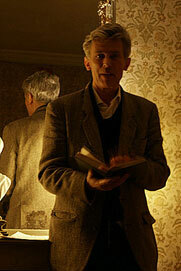 5 pm “Plessage or the Hedge-Man” - film made by Alain Dhouailly in 2008 at La Spouze, Creuse, with René Bourdet. 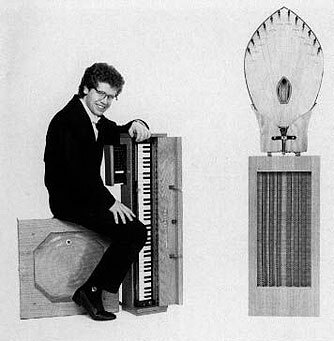 Recital of poetry on the subject of Trees by René Bourdet and his barrel organ. 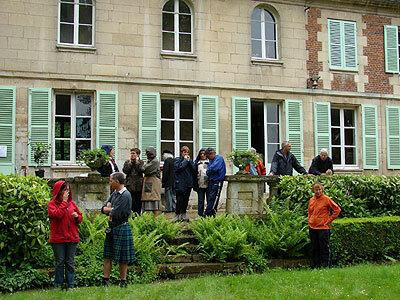 12 pm Arrival of visitors from the Jardins et Théâtre de Verderonne. 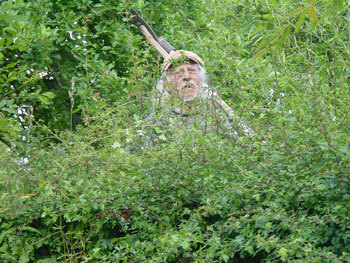 2 - 4 pm “Plessage or the Hedge-Man” - film made by Alain Dhouailly in 2008 at La Spouze, Creuse, with René Bourdet. The General Assembly will take place at 11am, followed by lunch at 12.30pm. A lecture on the subject of Vauban will be given at 2pm. We celebrated Halloween at the château with pumpkin carving, bonfires and an exhibition of artist-created Christmas and New Year cards. 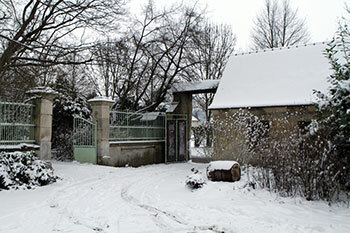 Artists from Picardie invite you to join them in their workshops (for more information, see www.picardie.fr). At the Château de Sacy, we will be showing works of art by Ruth Caig, Anne-Sophie Maignant and Emeric Hauchard every day between 12pm and 6pm. 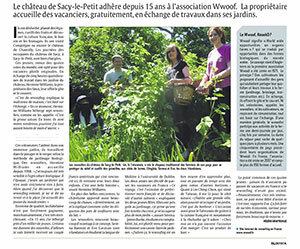 With the financial assistance of: Conseil Régional de Picardie, Conseil Général de l’Oise, the Village of Sacy-le-Petit. 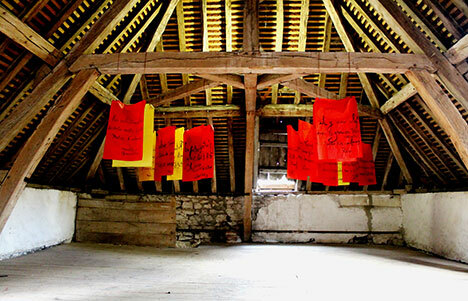 Les Ateliers d’artistes de Sacy are pleased to invite you to the Château de Sacy to meet Anne-Sophie Maignant who will present her work at 4pm on Saturday 7 June 2008, and Ruth Caig will present her work at 4pm on Saturday 5 July 2008. 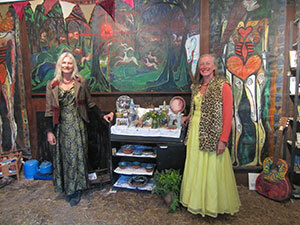 The exhibition of both artists’ work will take place from Saturday 6 - Sunday 28 September. All are warmly welcome. Photographer and video film-maker, Anne-Sophie Maignant questions the premises of the narrative. On this occasion installing her video camera in the Forest of Halatte, it is thanks to encounters made at the Château that she chooses her actors to take part in the development of an experimental fiction under the watchful gaze of Diana. Ruth Caig’s site-specific paintings are made in response to the physical experience of the architectural space. The scale, shape and positioning of the multiple supports dictate both the structure and the rhythm of the piece. Colour has become an increasingly important element of her work, the flat planes of colours and the flowing paint both playing crucial rolls within the work. 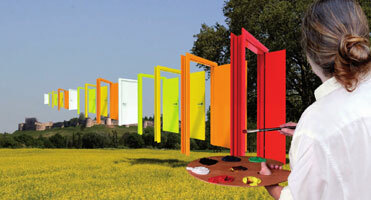 While in France her colour choice will reflect the surrounding landscapes. 7pm: Return of cycles to Sacy-le-Petit by truck. Anticipate contribution for taxi. 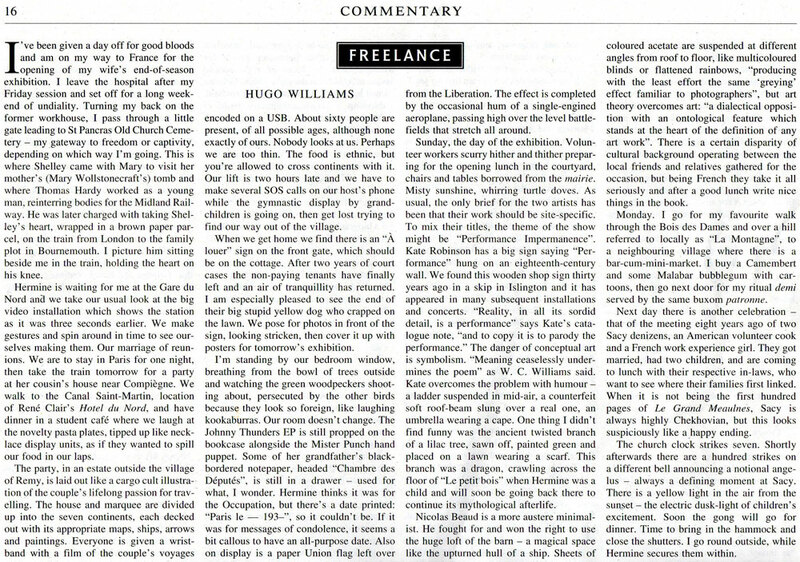 Hugo Williams’ article in the Times Literary Supplement. 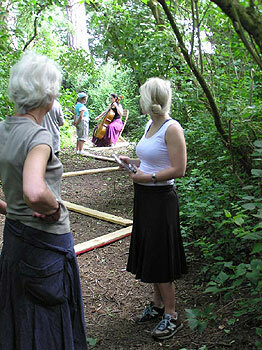 Followed by “Butterfly Mountain”, performance by Marta Hoskins. The house is open all days from 2pm until 6pm. 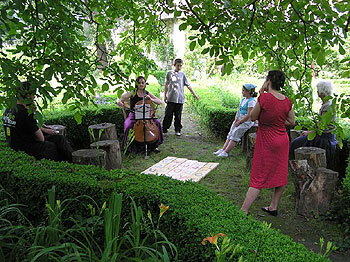 The grounds of the Château de Sacy will be open to the public and the cellist “Katia Renard” will give a performance on Sunday. 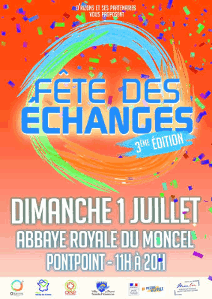 Ronald Suffield at 4pm on Saturday June 23th and Emeric Hauchard at 4pm on Saturday July 28th. 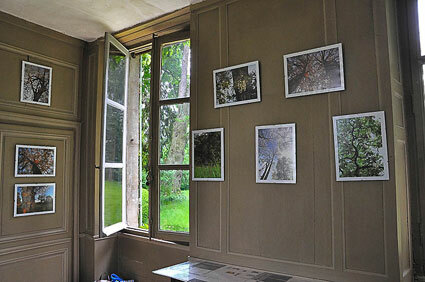 From 2 pm to 6 pm: exhibition of thirty photos of primates in the presence of Bettina, primate vet head of a Park in Gabon. From 12 to 6 pm: exhibition of sculptures made out of various recycled materials in the gardens such as “the solar fountain” of Henri-Georges Vidal and welded pieces and mirrors by Madeleine Langin. 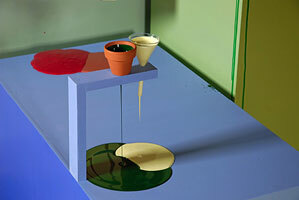 Installation by Lynn Schwartz with improvised music by “Press Button A”. 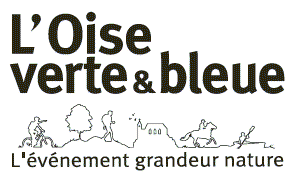 This event, organised by the Conseil General, is to enhance our territory’s landscapes and monuments. 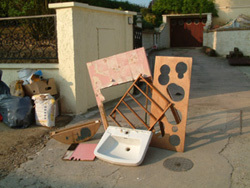 At Sacy, 3 artists (visual arts) recycle various materials to make sculptures to be exhibited outside. 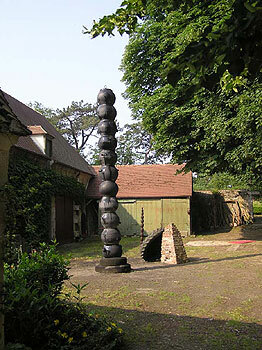 The solar fountain of Henri-Georges Vidal, once exhibited at the Jardin du Luxembourg in Paris, is to be found next to the welded pieces and mirrors of Madeleine Langin. 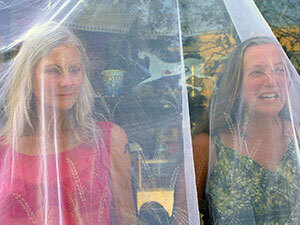 Lynn Schwartz has a choreography to accompany her installation on Sunday at 3pm with Katia Renard, cellist. 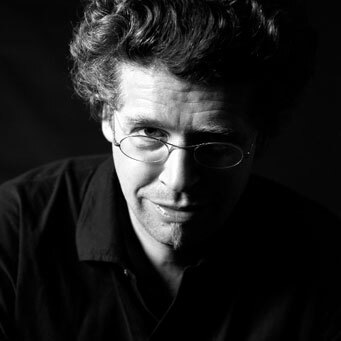 Stephen Romer will read from Tribut, a book of translation of his poems published by “Le temps qu’il fait”. 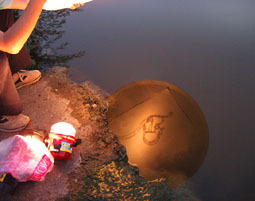 The artists will talk about their work on 23 June at 4pm (Ronald Suffield) and 28 July at 4pm (Emeric Hauchard). All welcome. The exhibitions of the artists’ work will take place from 8 to 30 September. The house is open all days from midday until six. All welcome. 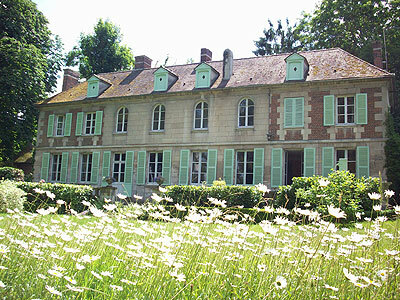 The grounds of the Château de Sacy will be open to the public. 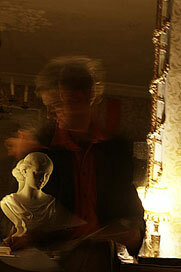 “Tempesta di Dolcezza” (ancient and baroque music) plays here for the 3rd time on Sunday 17th. All welcome. Chloe Steele at 4pm on Friday July 21st and Thursday August 24th at 6pm for Lynn Schwartz, followed by Orlando’s piano recital and a cocktail. Free entrance. at 7pm Saturday September 9th following the private view at 5pm of the artists in residence this summer. 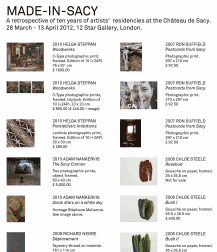 You may book by sending a cheque to Ateliers d’Artistes de Sacy. 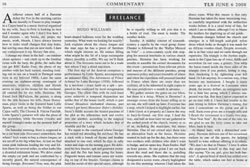 With the financial assistance of: Direction Régionale des Affaires Culturelles de Picardie, Conseil Régional de Picardie, Conseil Général de l’Oise, Essex County Council and Writtle College. 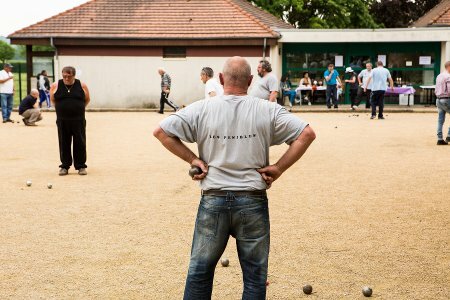 “Fête du Sport et de la Vie Associative” at Saint Martin Longeau on May 14th. 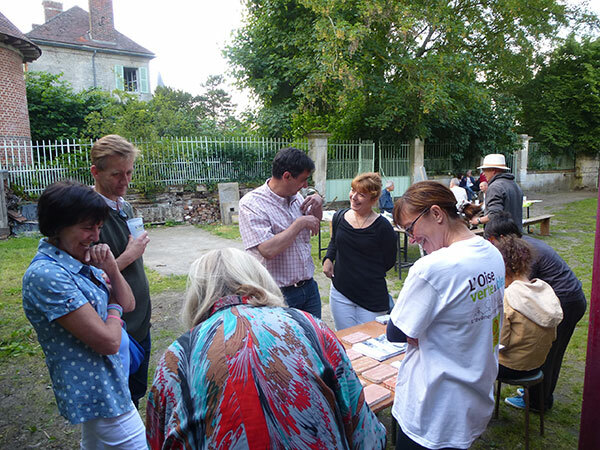 Brocante at Sacy le Petit on June 11th. 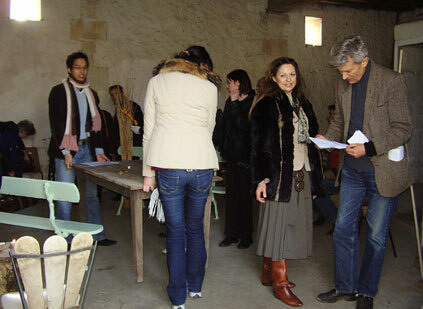 A new name for the association was voted for at the General Assembly of April 8th: “Ateliers d’Artistes de Sacy”. 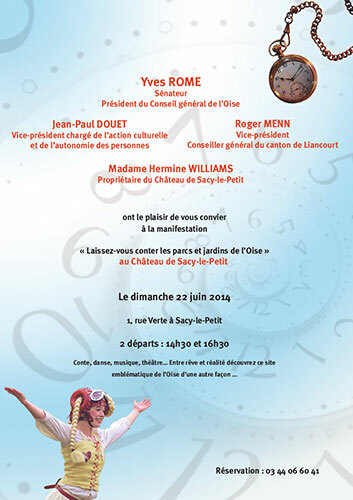 The grounds of the Château de Sacy will be open to the public on these dates. With the financial assistance of: Direction Régionale des Affaires Culturelles de Picardie, Conseil Régional de Picardie, Conseil Général de l’Oise, the British Council, Essex County Council and Writtle College. The grounds of the Château de Sacy will be open to the public on this date to celebrate the theme “Iron and glass: useful and decorative”. 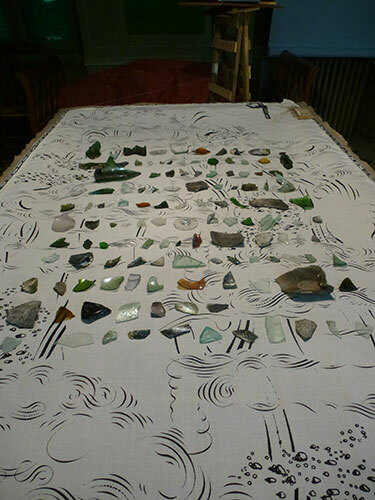 Resident artist Lisa Temple-Cox will display some iron and glass artefacts which she has brought over from England. All welcome. 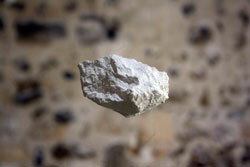 The artists will talk about their work on 20 June at 4pm (Lisa Temple-Cox) and 18 July at 4pm (Jennie Pedley). All welcome. 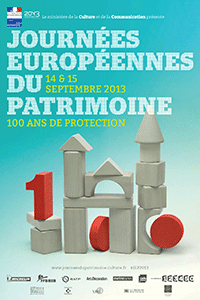 The exhibitions of the artists’ work will take place from 10 September to 2 October and then from 19 to 27 November. 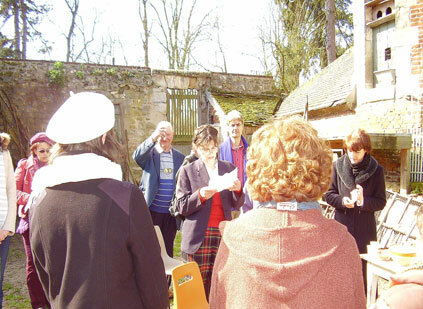 Our first gathering of the year: Easter Saturday, 26 March 2005 at 7pm with cabaret by Whistling John who will be giving a rendition of, amongst other tunes “In a Monastery Garden”. 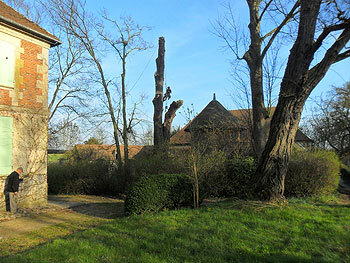 The architectural plan for the project to develop the courtyard at Château de Sacy into an artists’ workspace has been updated by the architect Gwladys Bazar. In order to now commence with the work we are looking for a Fundraiser to raise the 80-85,000€ capital cost required. The artists’ accommodation will make full use of renewable energies. We are looking to establish a timeshare amongst various artists’ associations and/or cultural bodies from European countries in order to cover the running costs. Click on the image above for the updated plan. 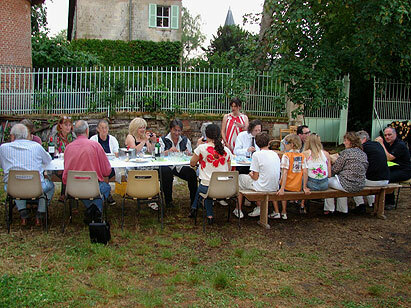 The Canadian Artist Luc St-Jacques was in residence at Sacy from 22 August to 16 October 2004 to realise the first phase of his visual art project “L’écran originel”. 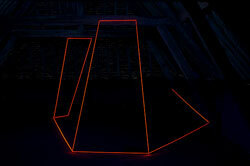 He also presented his installation “Le regard (re)porté” from 25 September to 3 October 2004. 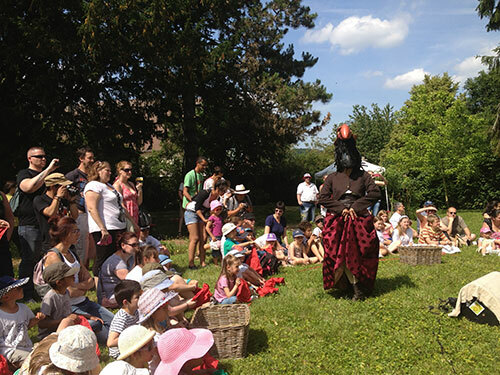 Financial support for the project was provided by the Centre Culturel Canadien de Paris. 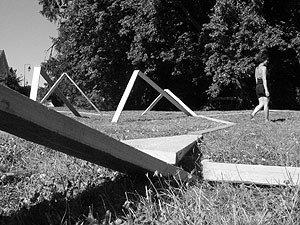 Opening Day: Saturday September 11th 2004 at 5pm including a performance by Valérie Thuillier who was in residence at Writtle College. With the financial assistance of Conseil Régional de Picardie, Conseil Général de l’Oise, the British Council, Essex County Council and Writtle College. 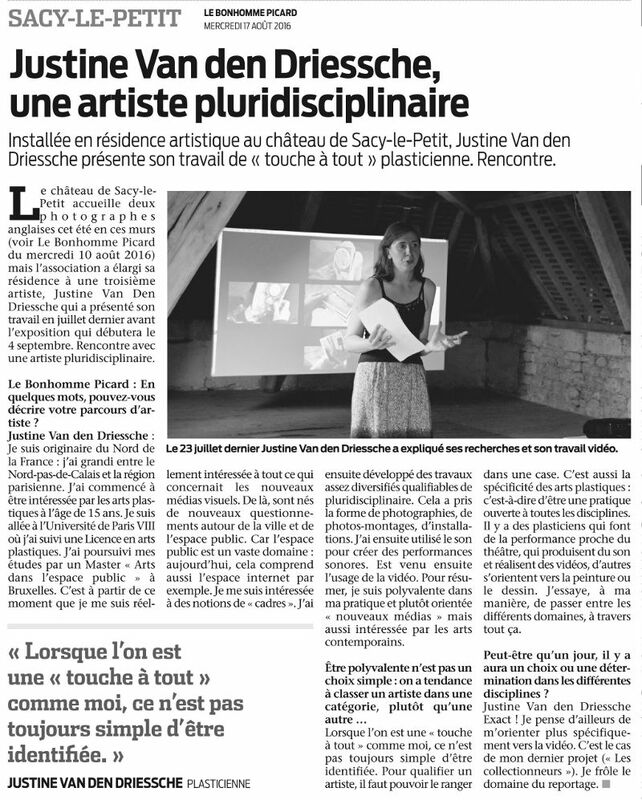 Picardie/Essex exchange artists Valérie Thuillier and Clare Iles will talk about their residencies, Valérie Thuillier at Writtle College and Clare Iles at Sacy. Free entry. 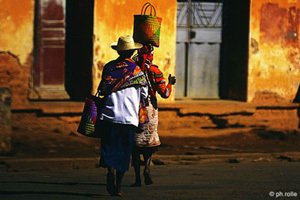 including MALAGASY: photographs of Madagascar by Philippe Rolle, and Martin and Olof on Swedish guitars. 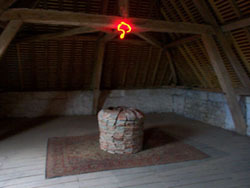 Grayson Perry, who was in residence here at Sacy in 1998 with his installation “Shrine to Essex Man”, won the prestigious Turner Prize in December 2003. 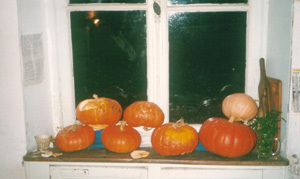 We celebrated Halloween on Friday 31 October 2003 with reminiscences, long walks, bonfires and pumpkin carving. Come to Sacy to see the exhibition and have lunch there and then (thanks for confirming three days beforehand for lunch bookings). 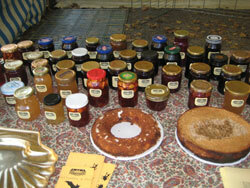 Visit our small brocante consisting of books, magazines, home-made jams, potted plants, seeds and nuts. Walk to the forest, go and see other exhibitions nearby. 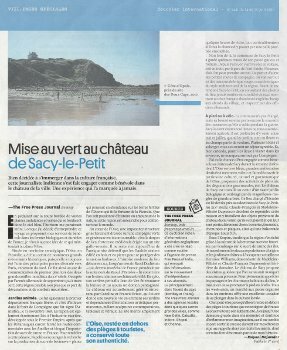 You may reserve an item by sending a cheque for £20 made out to Les Amis du Château de Sacy (refunded if item not acquired). Items attracting more than one purchaser will be auctioned (please tell us your limit). 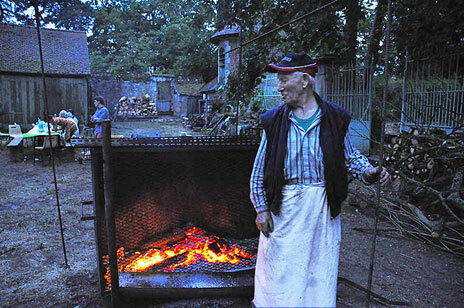 An exhibition of the works of the French photographer Joëlle Ferly took place at Château de Sacy each weekend in August 2003. 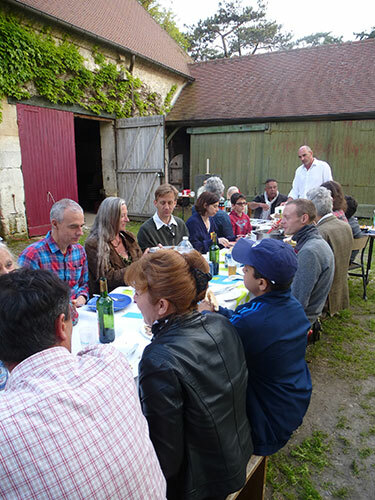 We held our second gathering of 2003 on Sunday June the 15th - a dinner with musicians Tempesta Di Dolcezza: Sibylle Diviné and Rosangela de Lima playing the flute, Céline Largeaud the cello, and Iya Zakovriachina the harpsichord. Michael Ferranti, the young talented cook from this year’s Dîner de Printemps, again provided a wonderful meal.